Combining storage and display space, the Amish Manchester 25.5" Corner Buffet and Hutch by Keystone beautifies a corner space as it shows off some of your classic collectibles. The Manchester has numerous custom options available. Now is the time to create custom storage with options right at your fingertips. The Manchester has a lovely top cabinet, one drawer, two lower cabinet doors and a beautiful center counter space. This corner hutch measures 35 3/4" wide, 82 3/4" high and the buffet is 39" high. 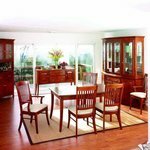 Amish construction covers all the areas in creating a the strongest, most attractive solid wood hutch for your dining room. Finish can make or break the look of a piece of fine furniture. For the Manchester, Keystone pulls out all the stops with everything from standard finish to distressing options to hand hewn specialty finishes. There's so much you can do to customize your hutch. Consider glass or wood shelving and a touch lighting option for this corner hutch. Choose hardware and pick from thirteen different types of glass for the doors. We have Amish Furniture Specialists who are happy to work with you in selecting the perfect custom options. We can't wait to see what you create! Email us at Questions@DutchCrafters.com or call Toll-Free 866-272-6773 to start your new Manchester Hutch today. Drawers are 6-Piece, dovetailed front and back. Drawers are constructed fully with the wood species selected for the piece, with no substitutions of wood-alternatives or cheaper species woods. Drawer backs and bottoms are also finished for maximum hardwood protection and longevity. Hutch backs are crafted from the same solid hardwood species as the rest of the cabinet, joined with tongue and groove joints for strength and perpetual beauty.